Composed of MCs Pumpkinhead, Block McCloud, and Mr. Metaphor, the Park Slope-based trio known as Brooklyn Academy has remained a bastion in the New York underground since the late 1990s. On their long-awaited debut LP, BORED OF EDUCATION, the three MCs bring it back to hip-hop’s golden era, focusing on intricate rhyme schemes and street-level production (from Marco Polo, Will Tell, Illmindz, Beat Brewers, and Black Milk, among others). 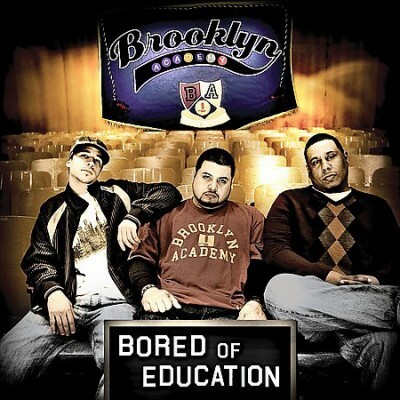 BORED OF EDUCATION features guest appearances from a handful of indie rap mainstays such as Jean Grae, Killah Priest, Will Tell, Ill Bill, Skam 2, and Keith Murray. comment "Brooklyn Academy – Bored Of Education (CD) (2008) (FLAC + 320 kbps)"